Above: Dave Hahn. Photograph by Grayson Schaffer. DAVE HAHN SAYS HE&apos;S ALWAYS been somewhat homeless. Born on a military base in Japan, he grew up in California and New York and has split his time among the tallest mountains of the world ever since. His mom, who passed away when he was 10, was from Albuquerque, and after Hahn graduated from college, in the mid-1980s, he headed for the Land of Enchantment. He got a job at Angel Fire ski resort in 1985. The next year, Ernie Blake hired him as a ski instructor at Taos Ski Valley; he’s worked there as a ski patroller since 1991. The job aligned well with his other work as a legendary climbing guide. 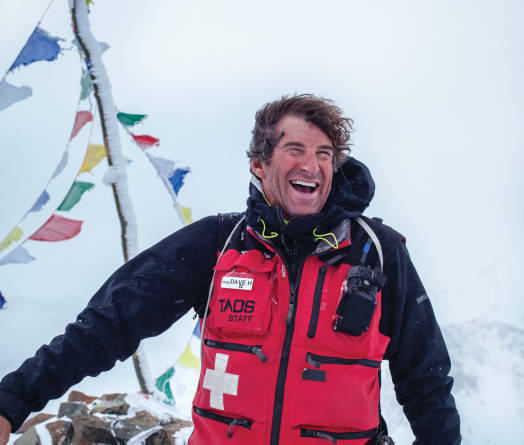 In 21 attempts, Hahn has summited Mount Everest 15 times—more than any other non-Sherpa on earth. He has also guided 35 summits of Antarctica’s Vinson Massif—that continent’s tallest mountain—and 30 summits of Alaska’s Denali. After two tragic guiding seasons, in 2014 and 2015, Hahn decided to stop taking clients up the world’s tallest mountain. Hahn, 57, now spends the spring as a heli-ski guide in Alaska. He still considers Arroyo Seco the closest thing to home. When I got out of college, I didn’t know what I wanted to do, but I knew where I wanted to go, so I moved to New Mexico and found my way up to the ski area. Certainly every ski patroller at a steep mountain like Taos likes avalanche work. It’s little boys’ stuff: playing with explosives, causing avalanches. It’s exciting. Everything is amplified when you’re up on Kachina Peak trying to control it in big snow conditions or big wind. Even with a lift up there, I’ve made a tradition of climbing Kachina as many times a day as I can get away with while someone is paying me. I wish I could say [of the first Everest summit], “Wow, that felt great,” but no, that didn’t feel great. I was alone, it was late in the day, I was in cloudy weather that turned into a snowstorm. I had so many problems I had to attend to, so many challenges in front of me, that I didn’t have time or energy to be all that scared. When it was all done, when I got to the bottom and survived it, that’s when it felt good to have summited, but that was also the beginning of realizing just how lucky I’d gotten and how close I’d come to not making it. It would have been hard to keep doing it all those years if it weren’t still that special and exciting to be on top. I never thought that that’s how I’d finish up my guiding on Everest, but yeah, those were difficult years, and certainly you had to do some hard thinking. You didn’t have to, but I did. I still have those same old fears going out each day. Is the mountain going to fall on me? Am I going to break through the glacier and end up in a crevasse? But also the healthy fear that motivates you: These people are depending on me. I better not let them down. I still get what I need from the mountains—not just the Himalaya or in Antarctica or Alaska, but the mountains here in New Mexico and Taos Ski Valley. I still get the challenge that I’m looking for from those mountains. I set out a couple days ago in the late afternoon in shorts and a T-shirt, and my intention was to just go for a half hour: get sweaty, breathe hard, and turn around. But once I got going, I got into it just the way I always have, and yeah, within a couple hours I was at 12,000 feet, standing up there looking over New Mexico, looking out at 6:30 in the evening. Oh my God, yes, it was the physical aspect of it—just good to train hard—but it was so amazing to see this place. I’ve been up there a bunch of times, but it all feels new when you’re looking at it and it’s that beautiful. You asked me before what’s kept me alive. It’s that I’ve remained scared of things. I haven’t gotten complacent, not on Rainier, not on Denali, Everest, or in Antarctica, or on the slopes of Taos Ski Valley in the Sangre de Cristos in a snowstorm in winter. I’m still scared. Scared of getting hurt. Scared of getting killed. And scared of getting other people hurt or killed. For many of us, you’re in a place like Taos, you’re a newcomer, you’re an outsider. The Indians have been living in Taos Pueblo 900 years, the Spanish have been here 400 years. You can’t help but consider yourself a Johnny-come-lately, but yeah, that’s a feeling I don’t mind all that much, and somehow I can reconcile that with it being my home as well. Taos Ski Valley hosts the Taos Winter Wine Festival January 31.